I wonder if the American Wake was a custom practised by the Gleesons? I recently had a most enjoyable lunch in a restaurant overlooking Central Park in New York with John Gleason (a 3rd cousin once removed). Our common ancestors are Timothy Gleeson and Catherine Ryan (born c.1800) who raised a family of seven children in Lower Shallee, Co. Tipperary, just west of Silvermines. One of these children was my great great grandmother (Ann Gleeson, 1848-1926) and another was John's great grandmother, Catherine Gleeson. Catherine's son (John's grandfather) was Michael Joseph Gleason (1885-1954). He was one of ten children (including Denis, Catherine, Mathew, Timothy, Martin, Maggie, Patrick & John). All were born in Knockmeal, just north of Kiloscully. Michael left for New York about 1907. He became a naturalised citizen some time around 1912-1913 (possibly 6th Feb 1913). 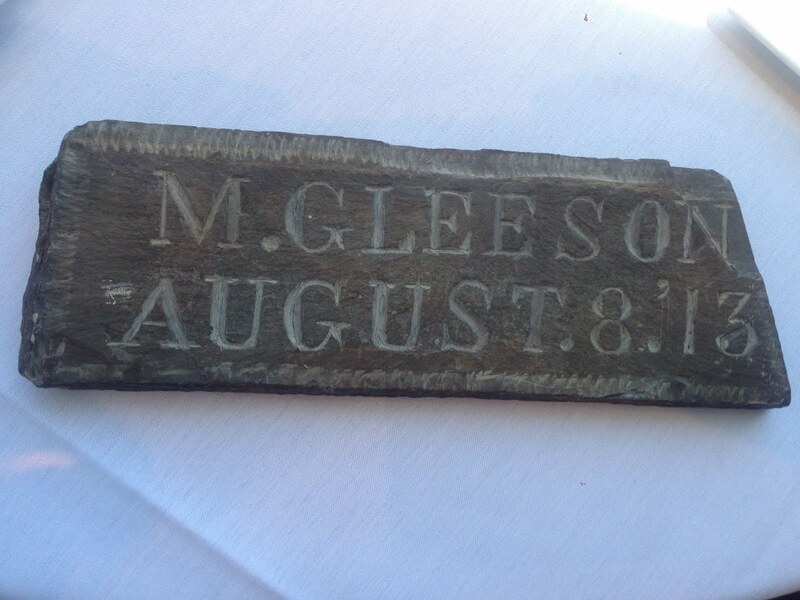 For many years the family has kept a slate that Michael presumably brought over to the US from Ireland. It is dated 8th August 1913. And we know from immigration records that he arrived back in New York (following a return trip to Ireland) on 29th August 1913. So we have emigration in 1907, naturalisation in 1912-1913, a return visit to Ireland in August 1913, and arrival back in New York on 29th August 1913. So what happened in Ireland on 8 August 1913, 21 days before his arrival back in New York? Was this the date of his "American Wake"? If anyone has any ideas, please leave a comment below. The mysterious slate which has been in the family home since 1913. If anyone has any ideas, please leave a comment below. The dire economic conditions in Ireland throughout the 1800's (and extending well into the 1900's) meant that for many people, emigration was the only option. This created heart-breaking scenes where the parents of a family would say goodbye to each of their children, one by one, over the course of several years, in the knowledge that this might very well be the last time they would ever be able to set eyes on them. The American Wake arose from these circumstances and was a natural extension of the Irish custom of the "Wake", where newly deceased loved ones are watched over by friends and family throughout the night before being buried. In contrast, the American Wake was a wake for the living. The practice of the American Wake has been known since the 1830's. In Mayo it was known as "The Feast of Departure". In the week or so before he left, the emigrant would visit friends and neighbours and invite them to the Wake which was often held the day before his departure. At the Wake itself, there would be liquor (often poteen, a type of Irish moonshine), tobacco (often in clay pipes), singing, dancing, reminiscing, story-telling, and lots of chat. Some affairs were celebratory in nature, others sombre and serious (especially in the more poverty-stricken areas of the country, where food and refreshments for the attendees could not be afforded). Sometimes the cost of putting on the Wake (and the cost of the emigrant's sailing ticket) would be covered by relatives already in America. Certain customs could be practiced at such Wakes. The emigrant could be given supplies for his long sea voyage, such as hard-boiled eggs, rye or oatmeal biscuits, and frog-bread, made from pulverising a roasted frog and mixing the resultant powder with bread dough. The latter was supposed to ward off fever during the journey. As the Wake neared its end, the emigrants father might dance a final jig with his departing son. This joyous and sad dance could be followed by keening, wailing and lamenting from the women, just as they would do at a wake for the dead. Another factor that served to equate emigration to America with death was a deep-rooted folklore belief that the land of the dead lay to the west of Ireland. Thus travellers to the west were believed to be fated to an early death. Finally, the guests would step out of the house into the light of dawn and final farewells would be said. The emigrant might be doused with liberal doses of Holy Water. The Parish Priest might give him a final blessing and some words of advice. And then he would walk away from the family home, perhaps for the last time, took a horse and trap down to the nearest train station, maybe accompanied by a convoy of friends and family carrying his luggage, and waited for the train to Queenstown (or some similar port) to board the boat to America. The tradition of the American Wake was revived during the recent recession and some photos of one such Wake held in Clare in 2011 can be viewed here. Print collection of Maggie Land Blanck - The contrasting joy and grief of the American Wake. "New York" is written on two of the trunks. It may have been something as simple as him leaving a piece of himself behind in the country he loved. Sounds like it was close to the day he left for the return trip to the USA. It was a superstition in my father's home place (co armagh) to bring a piece of home with you as an insurance that someday you would return. Pebbles, stones small bottles filled with soil were customery. Perhaps it is an extension of that belief. In my mothers home place (Mayo) it was a piece of thatch they brought and the intention was that it would be buried with one when that time came. Wow! Very interesting. I wonder if this piece of slate was mined locally in the "Silvermines" area. There were lots of open cast mines in the region.